WCLT - Nature Notes 1/6/2006 - Think you know nature? 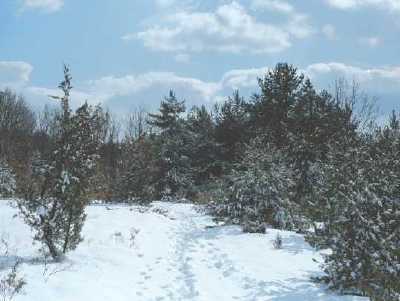 Winter in Westborough: A snow-covered trail beckons at the Bowman Conservation Area. Remember nature? You know, all that stuff outside that's alive? Nature can seem like a dim memory when we're more or less housebound, especially after the early snows we had in December. Turn your thoughts toward greener, lusher times and refresh your memory with the second yearly Nature Notes quiz, featuring plants and animals of Westborough. Below you'll find a list of short descriptions of plants and animals from Nature Notes columns published in the News in 2005. Match these descriptions with the plants and animals in the list of possible answers that follows. 1. Its crushed leaves have a pleasant and familiar scent and taste, even in the winter. 2. It is named for a legendary traveling Native American medicine man. 3. This climbing vine with small purple flowers and red berries is related to tomatoes, potatoes, eggplants, peppers, and tobacco. 4. It grows in Cedar Swamp and serves as food for caterpillars of the Hessel's hairstreak butterfly, a species of special concern in Massachusetts. 5. This bird can hover and fly backward, sideways, up, down, and even upside down. 6. This wild orchid has a checkerboard pattern on its leaves and tiny blossoms that are as small as an adult's little fingernail. 7. Its versatile tail is about as long as its body. 8. It's a fearsome and silent night-time predator that sometimes nests on Mill Pond. 9. It's an unusual-looking fungus that grows in grassy areas in Westborough in the fall. 10. It is famous for its foul odor. 11. Its furry-looking flowers are an early sign of spring-—look for them in February! 12. Local populations of this bird, which is not native to Massachusetts, have lost their urge to migrate. 13. It has thick white sap and its leaves are food for caterpillars of the monarch butterfly. 14. This tool-using bird has the surprising habit of using bait to catch fish. 15. This first butterfly of spring spends the winter in a kind of hibernation. 16. Its scarlet blossoms are especially well-suited for hummingbirds, which are their chief pollinators. 17. This Massachusetts native is smarter than most people think! 18. This evergreen shrub with dark pink blossoms was toxic to sheep and other animals that early New Englanders kept in pastures. 19. The flowers of this fall orchid look as if they are braided into the stem. 20. This bird is named for its sad-sounding coo, which it uses to stake out a territory and attract a mate. 21. It's a fungus that infects wild mushrooms, producing lobster mushrooms. 22. This springtime wildflower has purple blossoms, blue pollen, beak-like seed capsules, and a name that suggests a popular plant for flowerboxes and hanging pots.